Cornerstone Veterinary HospitalWhen you walk into a business you instantly get a sense of the atmosphere. Some are all business, some aggressive, others homey. When you walk into Cornerstone Veterinary Hospital you get a sense that this is a friendly place where competent professionals take pride in their business and their work. The practice, owned by veterinarians Anne Shakespeare and Christine Armao, opened last May a few doors down from the Department of Motor Vehicles office in Ithaca. "We wanted to have a downtown practice," says Shakespeare. "We thought this was a great location. It's right off route 13, we have plenty of parking, a wonderful landlady, and we were just thrilled." "We plan to stay small and intimate, and warm," she explains. "We don't want to be a big practice. We want to be a family-feel practice where we can provide long-term care." And that includes interaction with pet owners. "You are seeing people who are looking for answers, people who have animals and are showing their affection for their animals. You get to witness that and help them with that and you get to help them make really hard decisions about their animal, and feel like you are really making a difference." Most of their time is spent performing routine vaccinations and examinations, and neutering and spaying cats and dogs. But they offer a full range of services, including X-ray. They don't offer overnight care, so when that is required, or a case is complicated, they refer it out. The business focuses on small mammals. Shakespeare estimates that more than 90% of the animals they see are cats and dogs, but they have also treated rabbits, guinea pigs, hamsters, rats, and ferrets. Part of the treatment is the diagnosis, and with patients who can't speak that means paying close attention to animal behavior. "Even though they don't speak, it is rare for them to lie," she says. "Sometimes the owners might misinterpret their symptoms or make them out to be worse than they really are, but when you look at the animal, you get a pretty good sense of are they really hurting or not. Animals communicate in hundreds of ways that if you pay attention, you can learn a lot from your physical exam and what the animal is saying to you." Treating pets also means helping their owners make hard decisions. Sometimes the cost of a procedure must be factored into how much is done. "I think there is room in veterinary medicine for everybody to receive care for their animal," Shakespeare says. 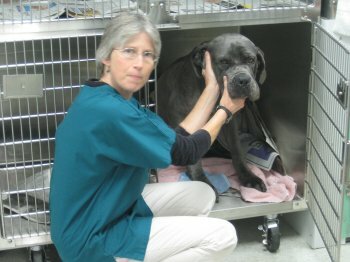 "I try really hard to give people a series of options for the care of their animal and not have them feel they are stuck spending thousands of dollars or doing nothing. There are all kinds of levels of care." The women naturally have their own pets. Shakespeare has two cats and three dogs, including a Katrina dog. Armao volunteered to help treat pets brought to Lansing in the Katrina Karavan early this year. And employee Ellen Stephens' cat was a patient at the hospital when a cactus spine he had swallowed lodged in his neck. While the two owners have plenty of experience as veterinarians, the business side was new. But the pair wanted their own business that they could fit into their lifestyles, so they began learning what it takes to run your own business. "I was really hesitant in the beginning, and it felt like I was almost changing careers to learn how to run a business," Shakespeare says. "It's been fascinating and now I'm as interested in the business aspect of this practice as I am in veterinary medicine." The pair split the tasks, with Armao managing the money side and Shakespeare handling advertising, inventory, and the computer end. They learned what they could from books, then sought the advice of an accountant. Armao's brother-in-law manages medical practices, so he helped them write a business plan that convinced a bank to invest in them. It all must have worked, because Shakespeare says the business is already in the black. "We are doing far better than expected," she says. "We haven't been through a winter yet so it's probably a little early to say that for sure, but we are paying all our bills with the money we are making right now, so we are thrilled." Two employees, each with about 20 years of experience, round out the practice. 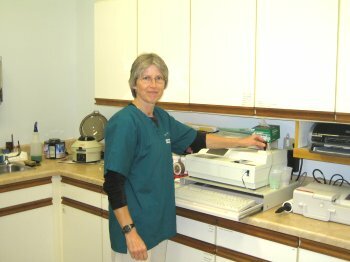 Joan Shaw serves as receptionist, and Stephens is a veterinary technician. All four clearly like being there, and that feeling translates to patients and their owners. "We plan on being here for a long time," Shakespeare says. "We plan on being partners for a long time, we will keep the staff for a long time. After six months of doing that we are really happy with the way it is working out."